Should I Buy a Power Meter for my Mountain Bike? As the effectiveness of power meters became more widely accepted on the road (and outside the pro peloton), it was only a matter of time before mountain bikers started to consider using them as well. Effective tools for training and time management, the cost is still prohibitive enough for many trail riders to go out and purchase one. Additionally, trail riders tend to be more about “the ride” than the data. And while that’s fair, riders may never talk about watts over the flow of a perfect run, collecting data can make you a faster, more complete rider. So, should you buy a power meter for your mountain bike? Unlike on the road, it is more difficult to pace yourself using a power meter when racing. On the trail there are many times where you simply have to power through obstacles or steep uphills just keep moving. You can’t just back off like you can on the road. Also, the benefit of being able to perform structured workouts in your training using a power meter is somewhat mitigated by the fact that on the trail, your effort is more dictated by the terrain than a power number. 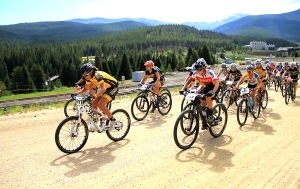 While using power to pace a race and perform structured training is less straightforward on a mountain bike, significant value comes in having race data to point out strengths and weaknesses and give an objective accounting of your effort. Looking at numbers and their corresponding place on the course can also help you to better understand the unique demands of the events you race – and train to those demands. Downhill racer Cameron Cole of Team Yeti is a new user of the Stages power meter as well, and likes seeing the details that power provides. “The downhill stuff has been great as we have been able to identify what is going on in DH with a lot more accurate and reliable data,” he commented. “We can get a lot more specific with the training sessions. This means we waste no time on sessions that may not benefit in our sport. Specificity is always high.” Particularly, Cole cites doing intervals as short as four seconds long and even looking at what the body is doing while not pedaling to fine tune his gym work. Finally, race data can also serve as a true account of your execution. When doing a race re-cap you can rely on numbers rather than hunches. Did you really “take it easy” on the first lap or did you just feel good because you were fresh? The data may show you went harder than you thought. What was the effect of your pushing so hard on the third lap? Were you able to maintain your power output or did it drop significantly, showing that you should have paced your effort more steadily? Did that big surge mid-race cause you to bonk or was it a lack of proper nutrition? Knowing the answers to these questions will help you refine your racing strategy over time. The value comes in having race data to point out weaknesses and strengths and give an honest accounting of your effort. Looking at power data can show the true physiological expenditure of the ride. During the Blitz to the Barrel, a race that combines DH, technical cross country and even a bit of cyclocross, Geoff Kabush’s Stages power meter showed he burned just over 900 calories and held 90 percent of his threshold power for the 59 minute effort, all while descending nearly 2,000 ft of vertical. Without this accurate accounting, how could Kabush know how to fuel properly and train at the right intensity? So now hopefully you see the value of having a power meter. Next comes the dilemma of choosing which bike to put this useful tool on. Are you wealthy with cash to burn? If so, go ahead and buy one for all of your bikes – problem solved. If you only own a mountain bike or put the majority of your miles on your mountain bike (like most gravity riders) then the choice is easy – put it on your mountain bike. For those that split time between your road, XC, DH or enduro bike this is when it gets tricky. As a general rule, the bike that you spend most of your time on is the one that should get the power meter. XC riders that put their weekday intervals in on the road then have fun on the trails on the weekend would be best suited by putting the power meter on their road bike. One big advantage to this is that since it is easier to do prescribed workouts on the road, you can completely dial in your training and intensity. The drawback is that you won’t have it for race day, or for your bigger weekend dirt rides. Still, you can use heart rate to get much of the same valuable data as we discussed above. This way you can still fully analyze your race, execute structured workouts over the week and go ripping the trails on the weekend. Hoke put his first power meter on his road bike, though now every bike is equipped with a power meter. Gravity riders tend to stick to just one or two bikes, so the choice is a bit easier for them. Cole has one on his DH and XC bike. Mountain biking, in all its forms, has been and will likely always be more experience-oriented and not a “by the numbers” sport. Still, for those that want to improve their performance and push their boundaries, using a power meter can prove invaluable. By seeing the true physiological needs of your discipline you can train more specifically for your sport and in the end, get faster. And being faster leads to having more fun.